The winning recipe from the Pillsbury Bake-Off has been getting a bit of flak because it uses refrigerated cookie dough. As creative and tasty it may be – not to mention a good use a General Mills products, which was a requirement of the competition – for many people it seems that the recipe as it is is just a little too simple to be worth a million dollars. Good – of course. The question is how good are they? Anna, a former Pillsbury winner herself, baked up a batch of the cookies as the recipe is written and they look pretty darn tasty. I decided to try the recipe with a twist – homemade, from-scratch peanut butter dough in place of the refrigerated kind. I actually wanted to try the recipe both ways – as written and from-scratch – and compare the two, but it turns out that my local supermarket doesn’t carry refrigerated peanut butter cookie dough at all. For the cookie dough, I used my best classic peanut butter cookie recipe and, instead of baking the cookies as drop cookies, I wrapped the dough in wax paper and refrigerated it until it was nice and firm. While waiting, I mixed up the filling and the topping. The filling is nothing more than a blend of peanut butter and powdered sugar. I opted to use a national brand (creamy JiF) peanut butter, in place of the salted natural-style I usually like to use, to ensure that I stuck closely to the million-dollar recipe. The topping is a mix of cinnamon, sugar and finely chopped peanuts that each cookie is rolled in before baking. I used roasted, lightly salted peanuts, which turned out to be a good choice because the peanut butter was slightly sweeter than I am used to and I really love a good sweet-salty contrast with my peanut butter. Once baked, I let the cookies cool and bit into one. It was really good, but didn’t blow meÂ away – largely because my expectations were so high! They’re a really fun change from a plain peanut butter cookie. The cookies themselves (sans filling) were great, with a crisp/tender edge and a softer center. I usually use chunky peanut butter in my peanut butter cookies and having the roasted peanuts on top gave the cookies a deeper peanut flavor, while the sugar seemed to add a bit more crunch than usual. The filling was soft and a bit melty when the cookies came out of the oven, then firmed up a bit as the cookies sat. It was good, but a little on the sweet side. I wouldn’t hesitate to make these again (it was fun to shape the dough), but I definitely would add some salt and perhaps a bit of cinnamon to the filling to amp up the flavors even more. Bake for 9 – 11 minutes or until edges are golden brown. Ah! You beat me to it. Those look great. I still might try it, but with a different peanut butter dough. Of course now there’s no sense of urgency since you’ve already done it ;). I found a recipe for bourbon spiked chocolate chip cookies and think I’m going to try it next. That one sounds like a winner already! These look delicious. I was thinking about cloning this recipe, too! You’ve already done it, so I’ll just use your recipe. Sometime soon. Even though they didn’t impress you much, Nic, they look yummy! I enjoyed the winning recipe with the refrigerated dough but I’m sure they are even better from scratch! Glad to have a recipe to turn to when I feel like making them again. Made these (from scratch) the other day and were a hit!! Thank you!!! Someone made these for me the other day for breakfast. Perfect for the commute. These look good, but sound like more trouble than they are worth. My favorite peanut butter cookies remain the three ingredient ones (1 cup pb, 1 cup sugar, 1 egg beat together and baked at 375 for 12 minutes). Can’t beat the time or the taste . . . nothing to distract from the peanutty taste. I happen to prefer smooth pb for mine, but a friend makes hers with the chunky (although I think she adds a little liquid). kudos for innovation…i love how chewy they look inside. 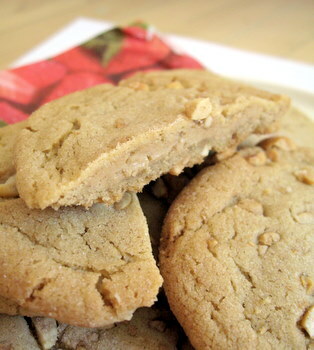 This was the 1st link that popped up for my web search on homemade peanut butter cookies and it is well deserved! Very easy to follow direction and not all too expensive either. I added some dark chocolate chips to the filling for a batch as well, adds a very nice chocolate flavor. i was going to make brownies from scratch but i didnt hav any coco so i made peanut butter cookies instead my family loved them!